IT has become a part of who we are as a society. We cannot be separated from its efficiencies and the changes it has made on our culture. 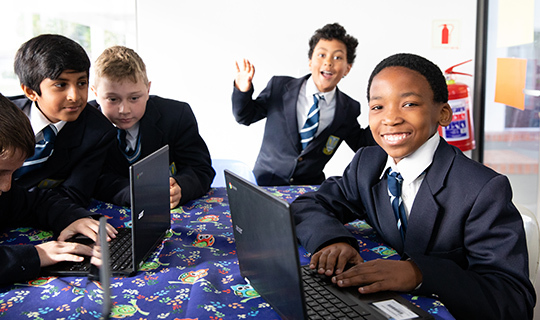 Kirstenhof’s starting point when it comes to technology is to answer the questions: How can technology enhance teaching and learning as well as , how is technology changing the skills set which will be required for our children to thrive in the World? To answer the first question. All classes have interactive whiteboards or large presentation monitors, according to their requirements, teachers are provided with high quality laptops, the school has an extensive WiFi network and there are sets of Chromebooks available for classroom use. Collaboration online. This is achieved through the introduction of the Google suite. We do not advocate a personal device at this point as we believe that children at the primary level should be free to write, spell, interact, argue, be creative, be on their own, listen and manipulate.